irrigation canals in search of her lost children. 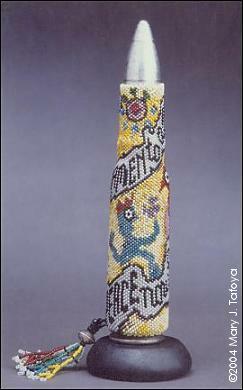 Notes: Simple running stitch with a bit of extra couching, on Ultrasuede, using Czech and Japanese glass seed beads. The bronzes and coppers of the cottonwood trees are rare metallic Czech true cuts and charlottes. 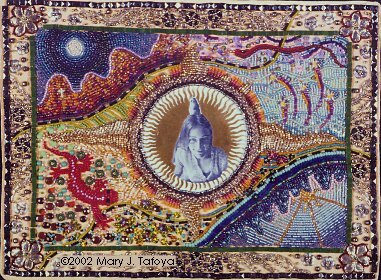 ❧ After I started this piece, I was inspired to change some of the design details mid-stream (such as the way the moon is cut off at the top), after a visit to the exhibit of One Hundred Aspects of the Moon, of works by the illustrious Japanese woodblock artist Yoshitoshi. 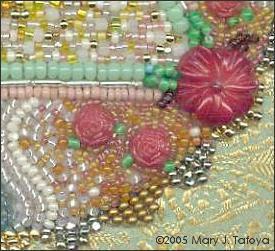 Notes: Peyote stitch with size 14 Japanese seed beads. Based on an illustrated poem by Kenneth Patchen. You can bet this was extremely challenging to chart... I created a chart for the lettering only, but had to abandon it during the extreme decreases. I sketched the outlines for the creatures directly onto the missile. I didn't have enough yellow for the background, so I combined all my yellows together. 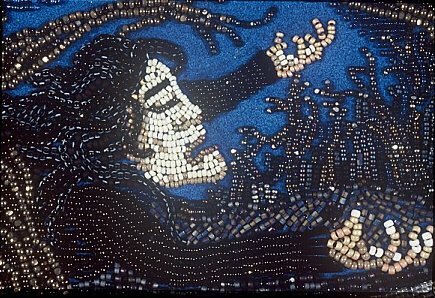 This fairly small-scale project required thousands and thousands of beads! ❧ The poem comes from the book, What Shall We Do Without Us: The Voice and Vision of Kenneth Patchen. 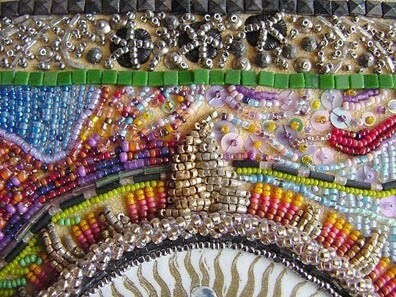 Notes: In the detail photo you can just see the top of the laminated linocut/halftone collage, beaded rope edging, Iroquois style embroidered sun rays, nailheads, seed beads, sequins, and vintage metal sequins. 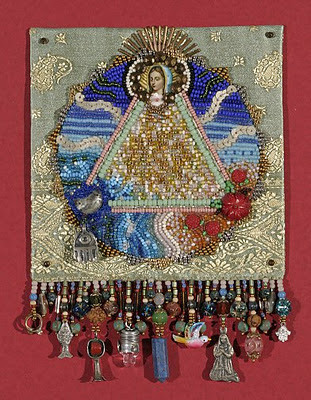 ❧ I talk a lot about the techniques I used in this piece in my webinar for Interweave Press, Bead Embroidery: Techniques and Inspiration. 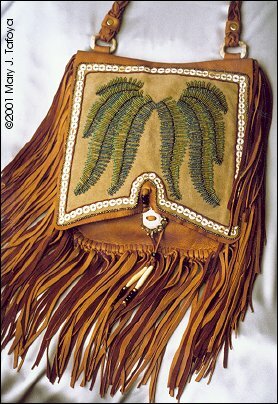 Notes: Bead embroidered with size 11 true cut beads and ostrich shell sequins on Ultrasuede, using hand sketched design on 100% rag paper, tacked to the back of the ultrasuede, then removed after the stitching was complete. 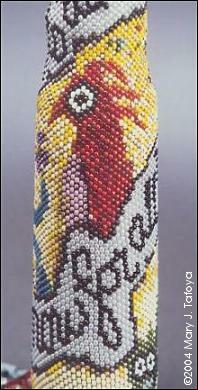 The completed beadwork was then stitched to the purse flap. ❧ Deborah's book also features a project by my polymer clay teacher Tory Hughes.